Straight outta the Pampas, this garlicky, spicy, pesto-like sauce makes tastebuds sit up and pay attention. In the land of the tango, one sauce is king. Chimichurri, a permanent fixture on the Argentine table, is like pesto that took a walk on the wild side. Green, herbal, garlicky, a perfect blend of heat and tang, its natural habitat is next to the grill. But Elvio and family's "gaucho" (cowboy style) "chimi" Tastes. Good. On. Everything. Transform vegetables, potatoes, grains, and bread. Slather it on your favorite cooked protein—eggs, cheese, tofu, and...well, good luck with your portion control. Rub the dry version on foods before roasting. Sauce or rub, chimi will reward your creativity. Qué bárbaro! ("Awesome!" in Buenos Aires.) Handcrafted in small batches with fresh parsley and garlic from local farms in Los Angeles, California. Grandpa Ignacio's "cowboy" chimichurri was born two generations ago, on the Argentine Pampas. Ignacio went on cattle drives every spring with other gauchos who agreed everything tasted better with his rustic chimichurri. 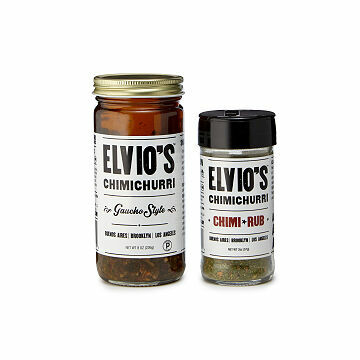 His son, Elvio, inherited his recipe, brought it to Los Angeles in 1974, and added some California peppers. After almost everyone he knew became addicted to it, he and his wife and children decided it was time to make the sublime family chimi available to the rest of us.